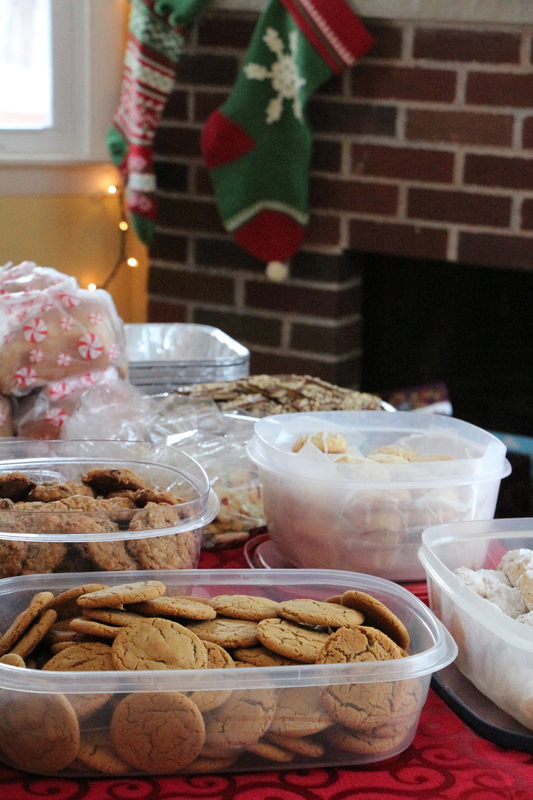 This past weekend, I hosted my third annual cookie exchange party. Cookie party, for me, is quite simply an excuse to have a bunch of my friends over to my festively adorned house, so we can indulge in afternoon cocktails and eat cookies. We eat cheese. 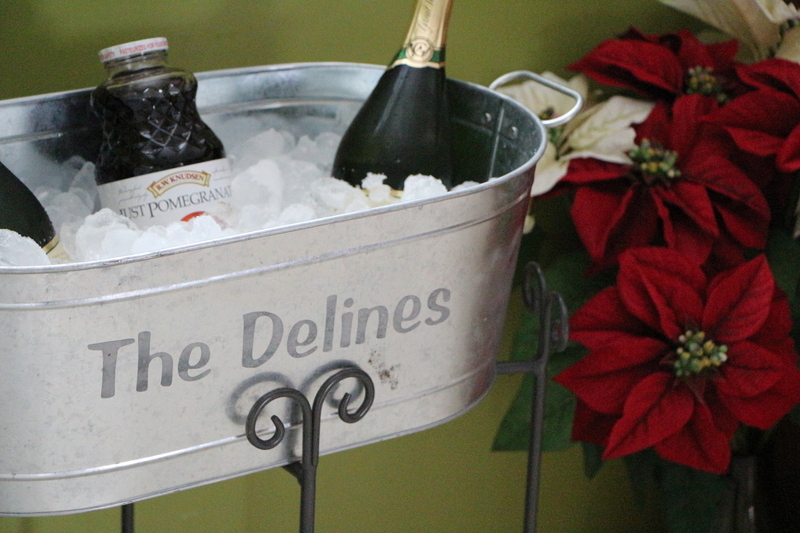 We drink holiday sangria, pomegranate champagne cocktails, and cocoa. We trade cookies. 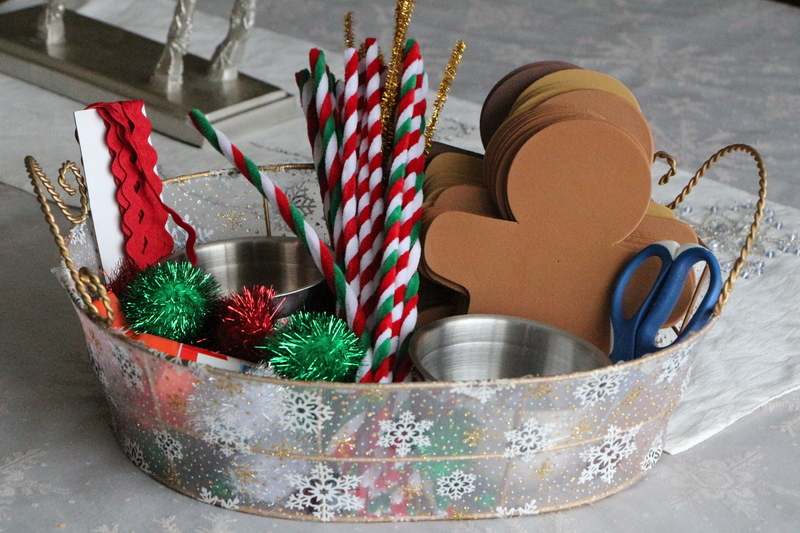 The kids make holiday crafts. Everyone has grand time. This year’s party was apparently so grand and inviting, that perfect strangers decided to join us. My cookie party got crashed by three women wearing Santa hats. They walked up our driveway, let themselves in through the front door, sat on our stairs to remove their winter boots, coats, and hats, then proceeded to walk through the house in search of someone they knew. One of my friends alerted me to the presence of my new guests, who were wandering my house at that very moment. I ran to my husband to find out what to do. We were just about to greet our new guests as they walked into the living room and realized their mistake. One woman, who appeared to be the mother of the other two, mumbled an embarrassed apology, then made a hasty exit. The other two women sat on the stairs while they laced up what seemed like the tallest winter boots in creation. 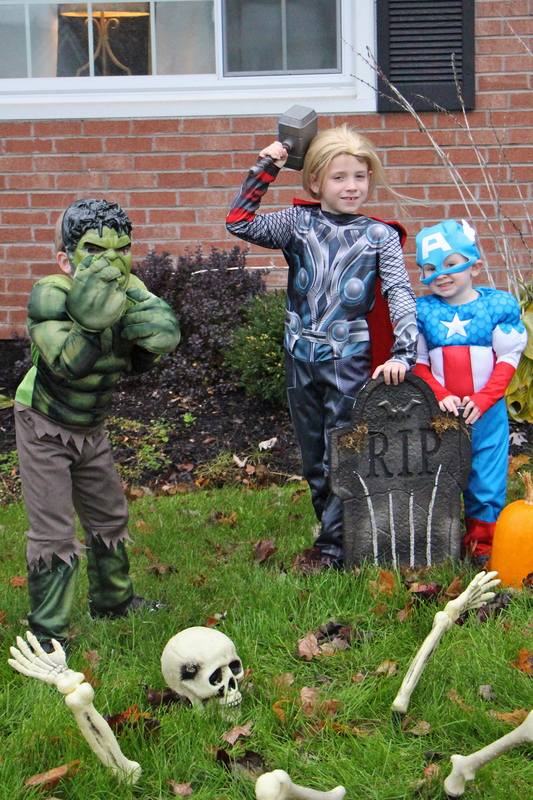 They then chased after their mom, who was already in her car driving down the road in search of their intended party. Had it been me, standing there, eating a piece of cheese in the living room of a complete stranger, surrounded by that stranger’s family and friends, I would have run out of that house barefoot, into the foot and a half of snow on the ground. Had they brought cookies to share, I would have eagerly encouraged them to stay. But, as I always say, every time someone crashes my cookie party… No cookies? No cocktails! Next year, I’m hiring a cookie bouncer for my party. 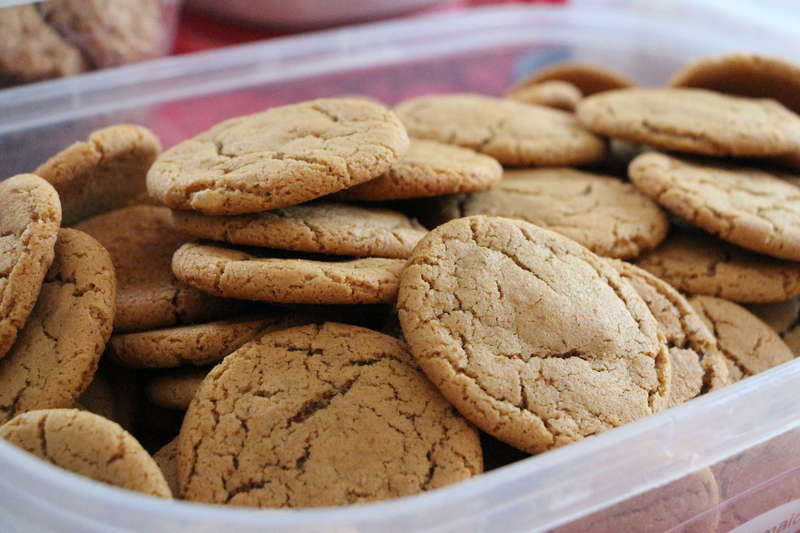 These spicy, triple-ginger cookies were my contribution to the cookie buffet. 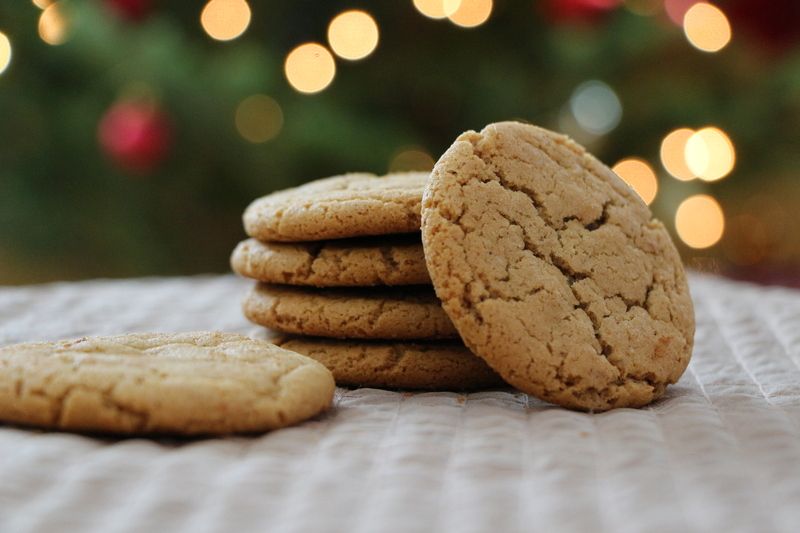 They’re sweet and chewy and oozing with gingery flavor. 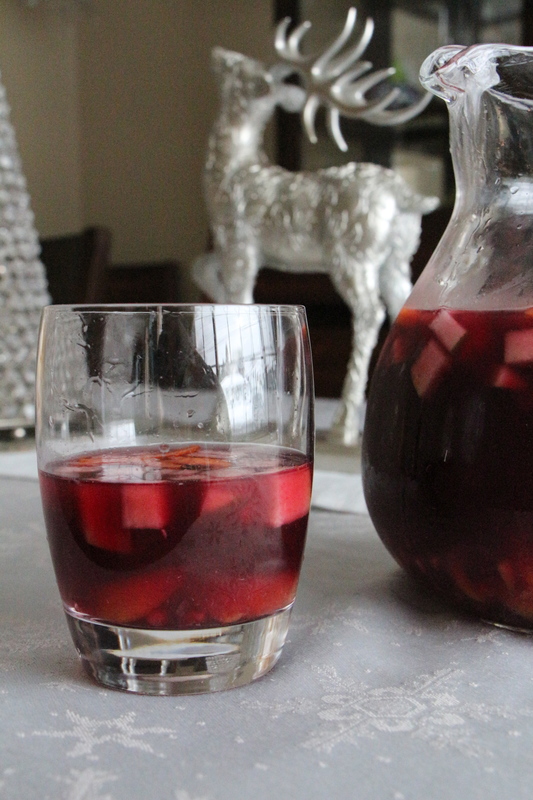 The holiday sangria, which follows, is accented with festive flavors of orange, ginger, cinnamon, and pomegranate. You’d have crashed my cookie party too, if you knew these cookies and sangria were waiting inside. Preheat oven to 350 degrees. Mix sugar, eggs, and oil. Add the remaining ingredients and stir until well blended. Roll into 1″ balls. Arrange the balls about 1 1/2″ apart on a baking sheet. Bake for 8-10 minutes, until crackles form on the top. 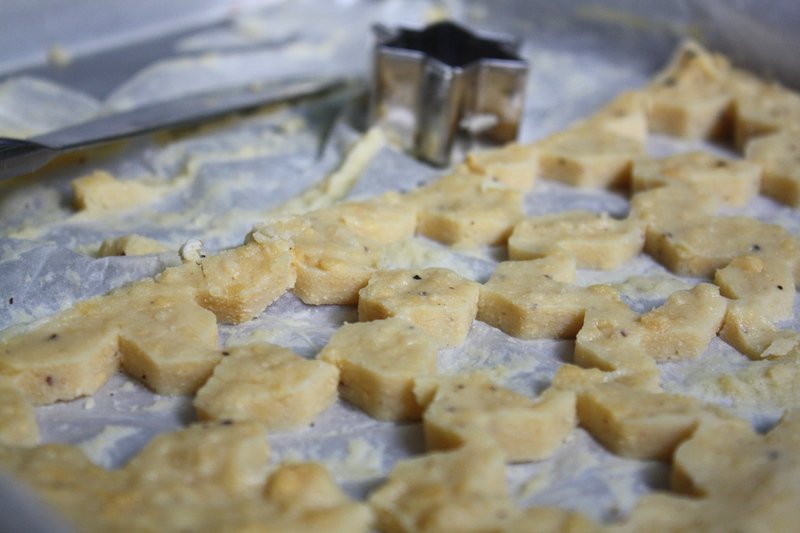 Remove the cookies from the oven, then give the baking sheet a little whack on the counter to flatten the cookies. Combine the wine, triple sec, orange juice, and ginger ale. Add the cinnamon stick and the chopped pear. Remove the arils from the pomegranate and add to the mixture. Remove the orange segments from the orange, chop into small pieces and add to the mixture. Remove the white pith from the orange peel, then slice the peel into small slivers. Add to the sangria. Chill and enjoy. Posted in Food and tagged Christmas, cookie exchange, cookies, entertaining, holidays, party, recipe, sangria, sutter home, wine. Bookmark the permalink. Apologies for my unplanned vanishing act. By the end of Day 1 of summer vacation, I was pretty sure I’d never make it out alive. I fought the chaos tooth and nail for the first week. Then I just I surrendered. Summer swallowed me whole and belched as I went down. 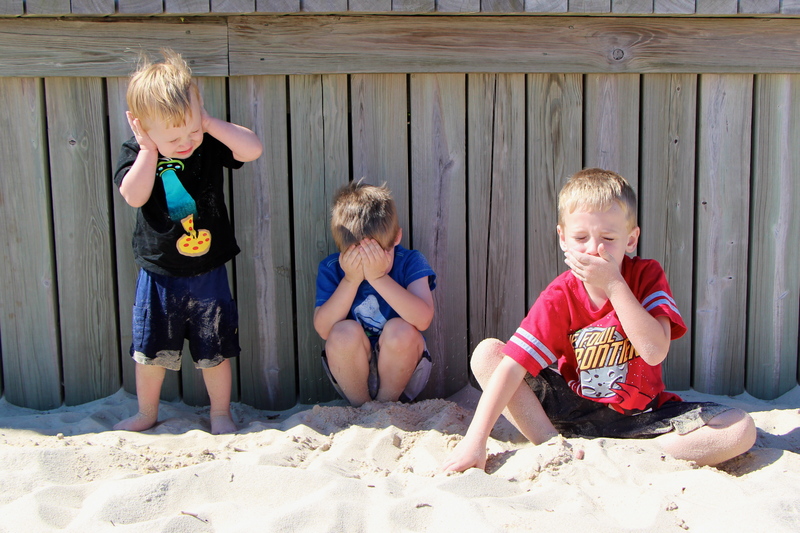 I ran on reserve power for most of the summer, focusing on only my most integral functions, like preventing the boys from maiming themselves during their daredevil play routines and rinsing the mud from their summer bodies three times daily. I’m going to make it up to you today though, with an entire menu’s worth of recipes. Have we got any Breaking Bad fans out there? I recently read some comment that watched in reverse, AMC’s Breaking Bad tells the inspiring story of drug lord who cleans up his act, beats cancer, reunites his family, and becomes a school teacher. Sounds like a Lifetime movie. In actuality, for the last five seasons, we’ve watched the tale of a seemingly normal man’s struggle with cancer and providing for his family crumble into the most unimaginable chaos, up to the point where last episode left off, with a suggestion that perhaps there’s nothing left of that kind, normal man. The show is widely considered one of television’s best dramas and for good reason. I’m approaching the series finale with mix of eager anticipation and deep sadness for its ending. In honor of its finale, the good folks at Cinema Blend asked me to put together a little Breaking Bad themed dinner party menu. Though not in any way a show about food, Breaking Bad gives us no shortage for dinner party inspiration. Many of the shows pivotal confrontations occur over some of the world’s most awkward meals. The following menu, designed with a New Mexican flare for the show’s setting, should give you a few good ideas for hosting your own Breaking Bad series finale dinner party. Check out Cinema Blend for all of the latest coverage, recaps, and reviews of Breaking Bad. 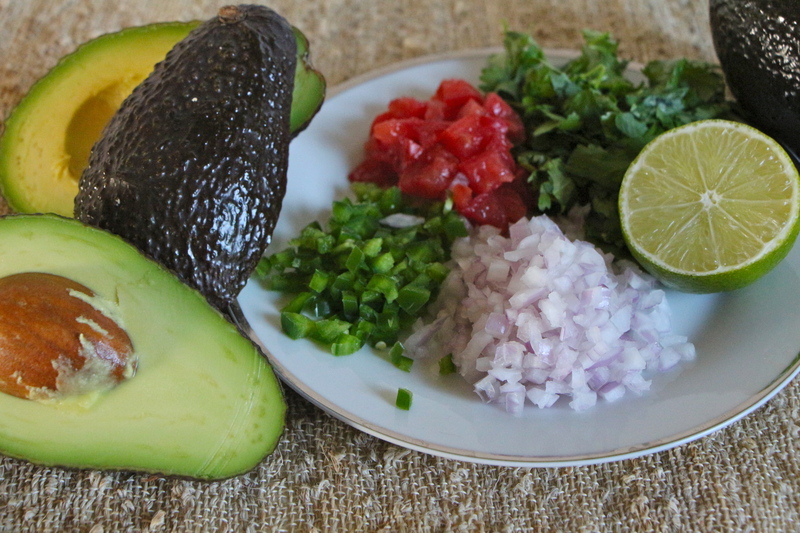 Make this guacamole tableside to your guest’s liking, or prepare it ahead of time. *Squeeze a bit of lime juice over the top and cover securely with plastic wrap to prevent browning. 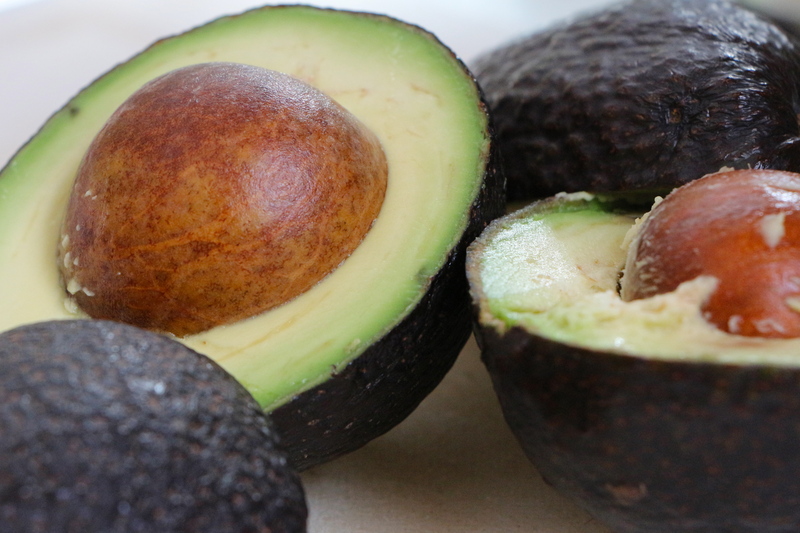 Smash the avocado using the backside of a fork, a potato masher, or with a mortar and pestle. Stir in the remaining ingredients. Adjust quantities as desired. 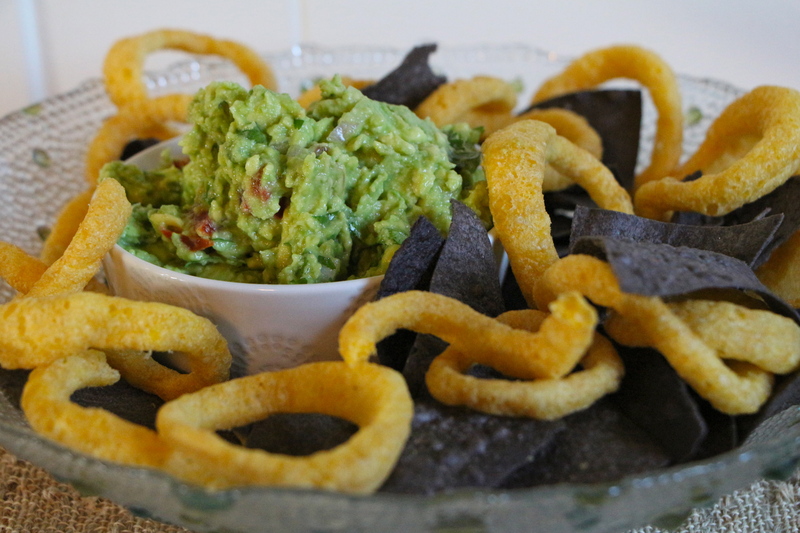 Serve with Walt’s signature blue tortilla chips and Jesse’s favorite Funyuns. To go full Breaking Bad style, wait to offer this to your guests during the most tense part of the evening. Orchestrate tension, if necessary. No Breaking Bad menu would be complete without some fried chicken, from Gus Fring’s Los Pollos Hermanos, the fried chicken joint which played heavily into the show’s third and fourth seasons. 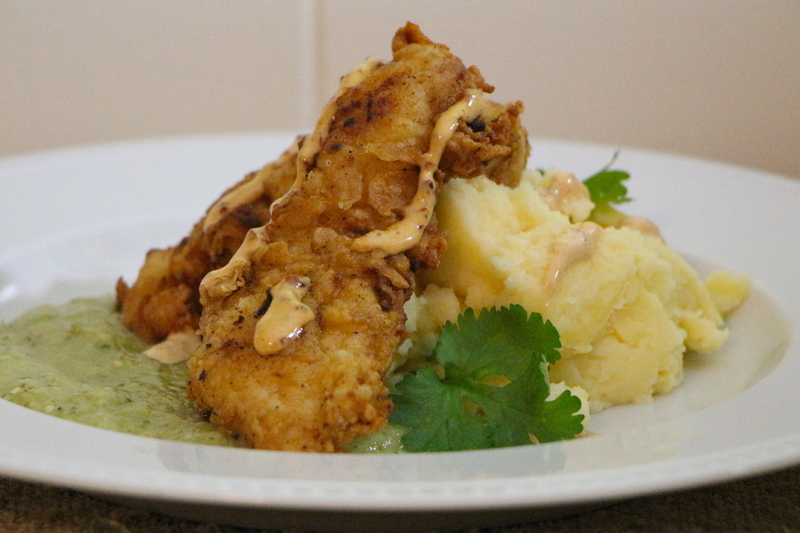 We served our boneless fried chicken tenders over a spicy salsa verde, drizzled with a bit of chipotle mayo. 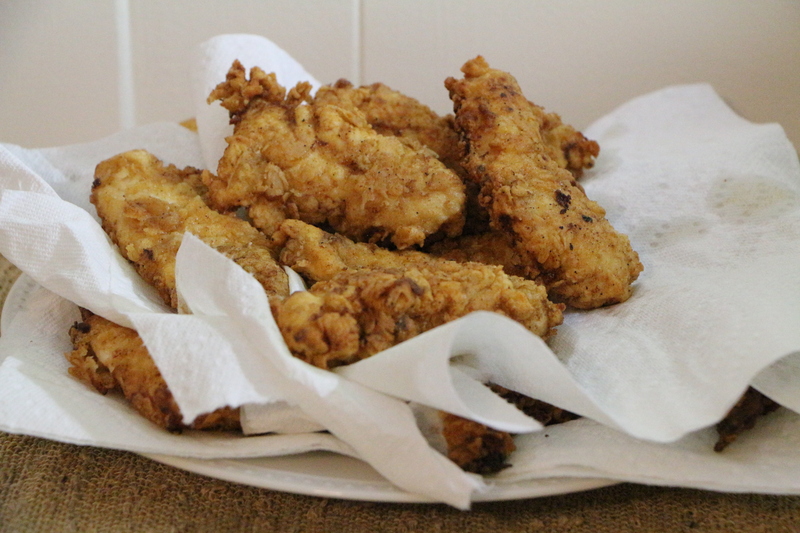 Soak the tenderloins in 2 cups of the buttermilk in a covered container in the refrigerator for a few hours. Heat the vegetable oil in a large frying pan over medium/medium-high heat, until sizzling hot. Whisk together the remaining cup of buttermilk and the eggs in a large bowl. Transfer the chicken tenders to the egg mixture. 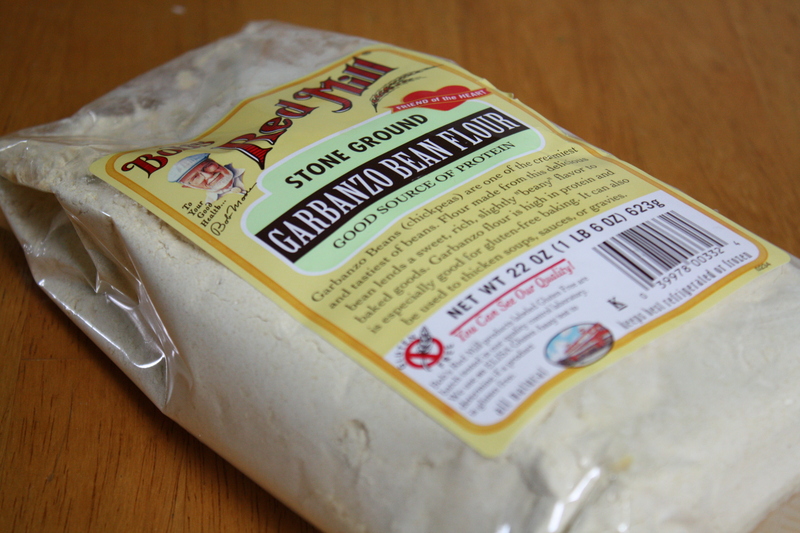 In a small baking dish, stir together the flour, garlic powder, salt, paprika, and cayenne pepper. Remove the chicken tenders from the egg mixture. Allow the excess to drip off. Press the chicken into the flour mixture until well coated on both sides. Place in the hot oil. Cook for about 3-4 minutes on each side, until cooked through and golden brown. (The chicken should sizzle when placed in the oil.) Drain the cooked tenders on a paper towel. Repeat in small batches until all of the chicken has been cooked. *Use jalapeño for a spicy sauce. Use serrano for a more mild sauce. 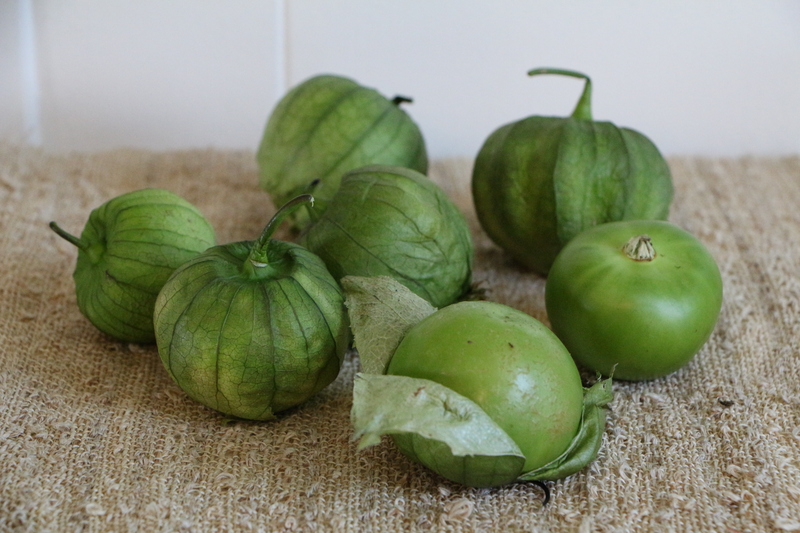 Remove the husks from the tomatillos. Rinse. Cut off the stem, then halve. Place the halved tomatillos, garlic cloves, and jalapeño or serrano pepper on a baking sheet. Lightly rub the tomatillos, peppers, and garlic with olive oil. Roast a few inches under the broiler for about 5 minutes. Flip them over and roast the other side for about 5 minutes. 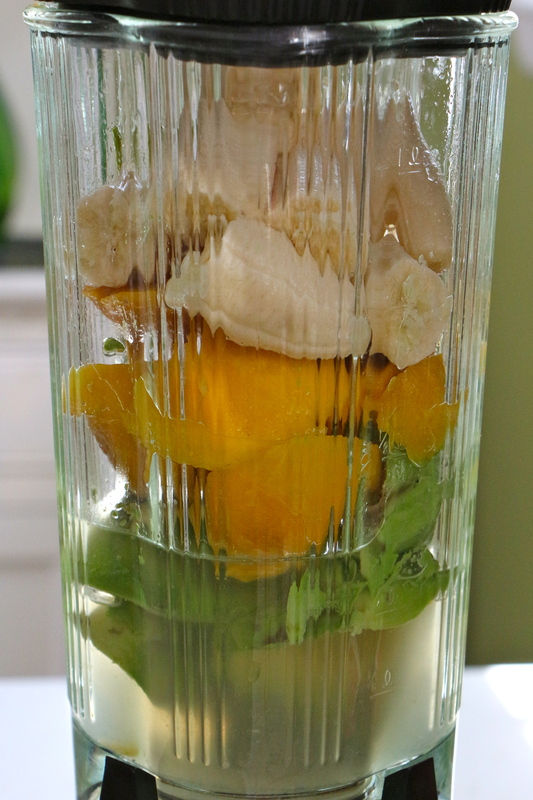 Once cool, transfer the entire contents of the tray (including the juices) to a blender. Add the onion and cilantro. Blend to desired consistency. Season with lime juice and salt, to taste. Combine all ingredients until well blended. The fifth season’s episode “Fifty-one”, finds Walt, Skyler, Hank and Marie seated once again at a dinner table on Walt’s 51st birthday, reflecting back the past year, with Walt spinning a web of lies while Skyler silently contemplates an escape for herself and her children. Attempting to break the tension, Marie offers a compliment about Skyler’s mashed potatoes, eager to learn how she removed all of the lumps. Skyler distractedly credits the use of a potato ricer, though her potatoes were actually store-bought and microwaved. It may not truly be Skyler’s trick to creamy potatoes, but a potato ricer is in fact the ticket to smooth, non-gummy potatoes. By pressing the cooked potatoes through the ricer, lumps are thoroughly removed, without disturbing the cooked starches too much. I’ve had my eye on a potato ricer for many years now, though the idea to purchase one always corresponds with the holiday season, when I’m bleeding money and just can’t wrap myself around the added expense. I bought myself one yesterday in honor of this dish. Those are some smooth potatoes! Place the potatoes in a large saucepan. Add water to just cover the potatoes. Bring the water to a boil. Cook for about 10 minutes, until fork tender. Allow to cool slightly. Mash the potatoes in a potato ricer or food mill. Alternately, use a potato masher. Stir in the sour cream, cheese, milk, and jalapeño, just until blended. Do not over-stir. Add more milk, as desired, to reach your preferred consistency. Season with salt, to taste. Oh, Jesse, Jesse, Jesse… poor conflicted man, with any chance of living his American dream looking pretty hopeless right about now. Trapped in a concrete cell by some uber-creeps, Todd (no doubt the creepiest one of all) offers him some Ben and Jerry’s ice cream, giving him a choice between Peanut Butter Cup and Stephen Colbert’s Americone Dream. Stephen Colbert’s Americone Dream combines vanilla ice cream with fudge coated waffle cone and caramel. This ice cream pie is inspired by the crave-worthy Ben and Jerry’s flavor. A waffle-cone crust gets coated with rich chocolate ganache then filled with vanilla ice cream and drizzled with caramel. *Did you know that you can make a pie crust out of just about anything that crumbles? Combine two cups of crumbs with enough melted butter to make it stick (I usually use 10-12 tablespoons for 2 cups of crumbs, though other recipes use less butter), then press it into your pie shell and bake for a few minutes to set. Stir together the ice cream cone crumbs and melted butter, until it sticks together when pressed. Press the mixture into a deep dish pie pan. Bake the crust for 10 minutes. Cool. Bring the cream just to a boil, then remove from heat. Stir the hot cream into the chocolate chips. Stir until melted. Pour the ganache onto the bottom of the pie crust. Use a spatula to spread the ganache in an even layer on the bottom and up part of the sides of the crust. Cool. Allow the ice cream to soften at room temperature. 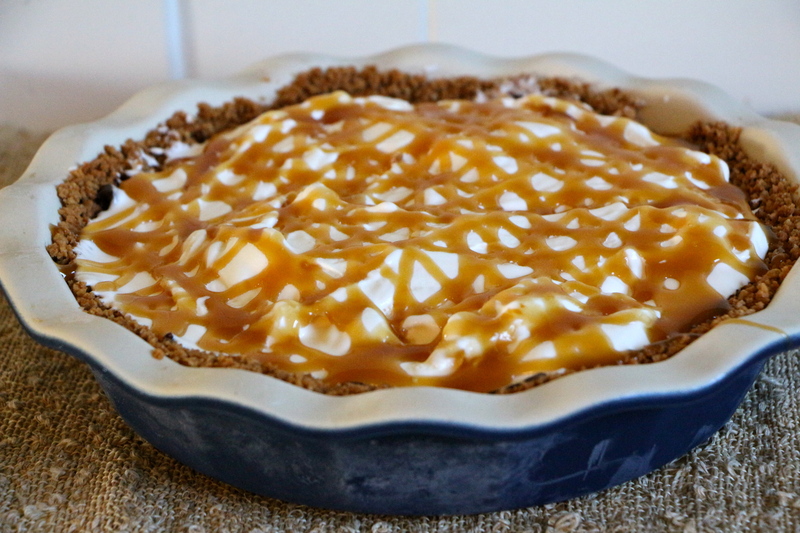 Spread the softened ice cream into the prepared crust. Place the pie in the freezer to set. Before serving, drizzle with caramel sauce. 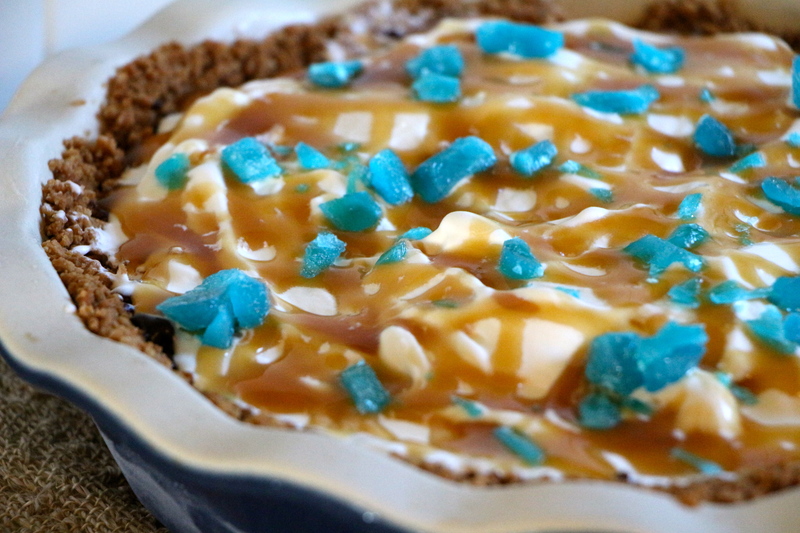 For more of a Breaking Bad effect, garnish the pie with little bits of blue rock candy or crushed blue hard candy. *You might want to wait until the kids go to bed before adding the crystal blue garnish. It just didn’t seem right to have the kids around pretend drugs, even if they’re clueless about the reference. Blue is Walt and Jesse’s signature color. 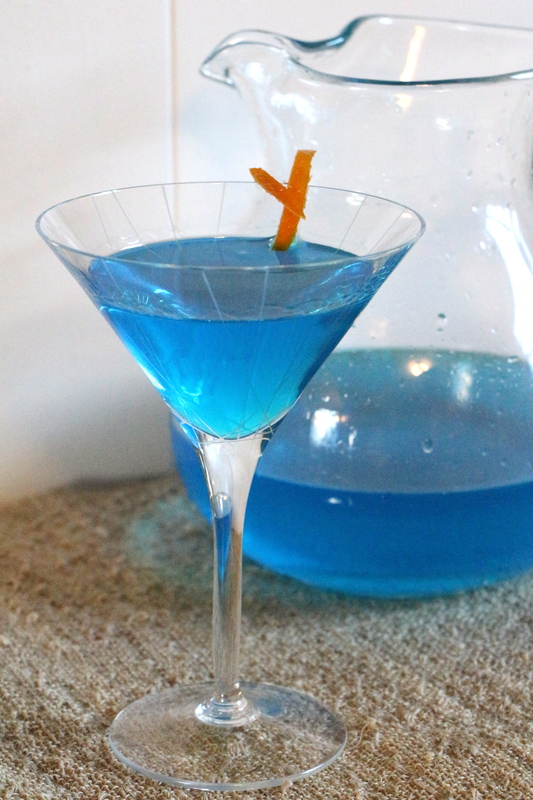 This crystal blue cocktail is oozing with orange flavors. I used an orange infused simple syrup to sweeten the drink, in order to preserve the beverage’s crystal transparency. *This is a strong one, folks. Drink responsibly. Combine all ingredients in a cocktail shaker with ice. Pour off the ice. Garnish with orange peel. Combine all ingredients in a saucepan. Bring to a simmer, stirring until sugar is completely dissolved. Simmer gently for about 3-5 minutes. Remove the orange peel and reserve for garnish. Cool. Rooftop Roasted Pizza, just how Walt likes it. – Try any of the pizza recipes in the pizza section of my recipe collection. Green Beans Almondine, like the store-bought ones that so impressed Jesse during his dinner at the White’s. Breakfast with a number made of bacon, Walt’s annual way of bringing in his birthday. 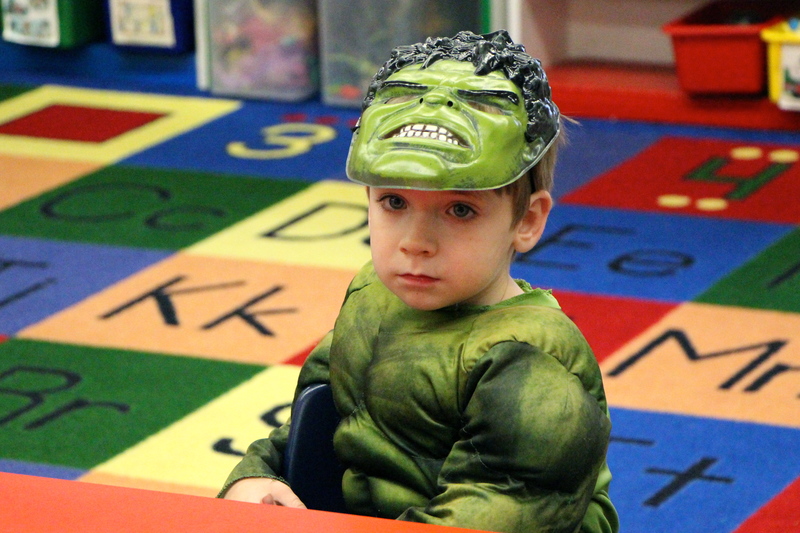 *This pic is from my son’s fifth birthday dinner. He is nothing like Walter White, except that he like breakfast foods and bacon. Rice ‘n’ Beans – Say it again. Rice ‘n’ Beans. Get it? Ricin Beans ** WARNING** DO NOT USE ACTUAL RICIN. It’s poison. Posted in Food and tagged AMC, Breaking Bad, chicken, Cinema Blend, dinner party, entertaining, guacamole, Heisenberg, menu, mexican food, recipe, Walt White, Walter White. Bookmark the permalink. Many years ago, I made a friend for life during my college orientation weekend. I don’t recall how we first met. We may have been seated next to each other during some presentation to incoming freshmen. However it happened, it was kismet, as they say. We became instant friends that weekend, as we explored our new school and the town which would be our home for the next four years. We spent the rest of the summer sending handwritten letters to each other. Yes, this was before the time of facebook, widespread email, and texting. Freshman year we grew closer. And as roommates during our sophomore year, we were practically inseparable. In fact, the vast majority of my college memories in some way involve this particular friend; memories involving mermaids (and mermen), dance routines with a big finish, a glowing Red Dog clock, flooded suites, and self-directed midnight evacuation drills from our second floor dorm building. Note to self: Scaling the side of a brick building with your sheets tied together will result in holey sheets. And laughter. Lots of laughter. In the years after college, we moved in different directions, geographically. Separated by distance, our opportunities to share drinks, laughter, and miscellaneous mischief have become fewer and farther between. 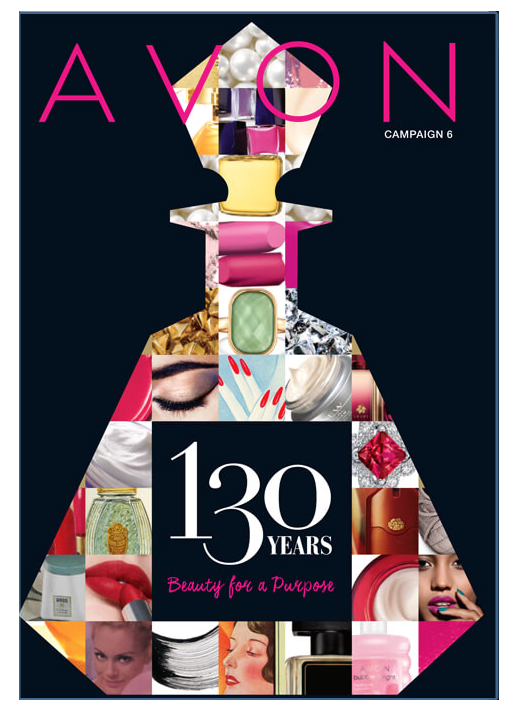 But we will always share a part in each other’s celebrations, successes, and challenges. She stood as my bridesmaid during my wedding and wore a pin I gave her in her hair as she celebrated her own. Though we now live, quite literally, on opposite sides of the globe, my dear friend will always remain close in my heart. I feel fortunate that our lives crossed paths. 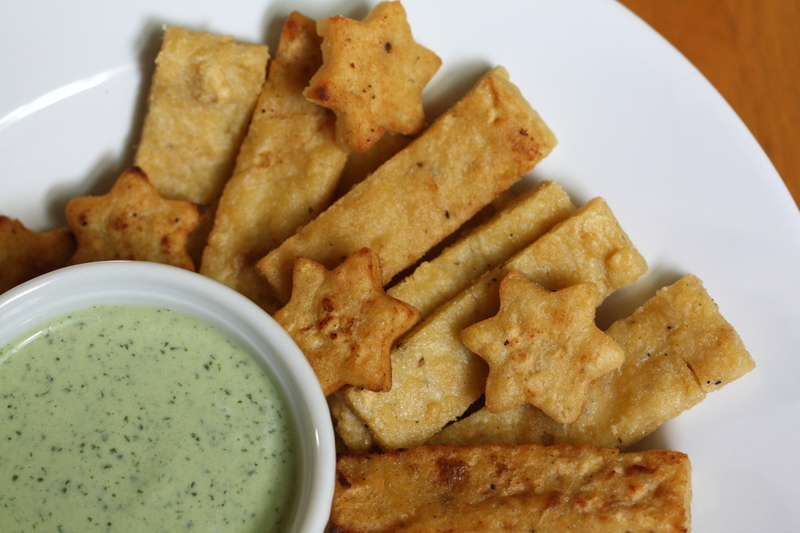 Recently, my globe-trotting pal sent me a link to a Mark Bittman article, which describes a process for making a sort of chickpea fries; crisp on the outside with a smooth, custardy center. Yum! Only, the article is a bit vague on the exact procedure. My friend’s first attempt never made it to the taste-testing phase. Dying to love these little goodies, she sent a plea for help. I told you we’d always be there for each other’s challenges! Vegetarians and gluten-free eaters rejoice! 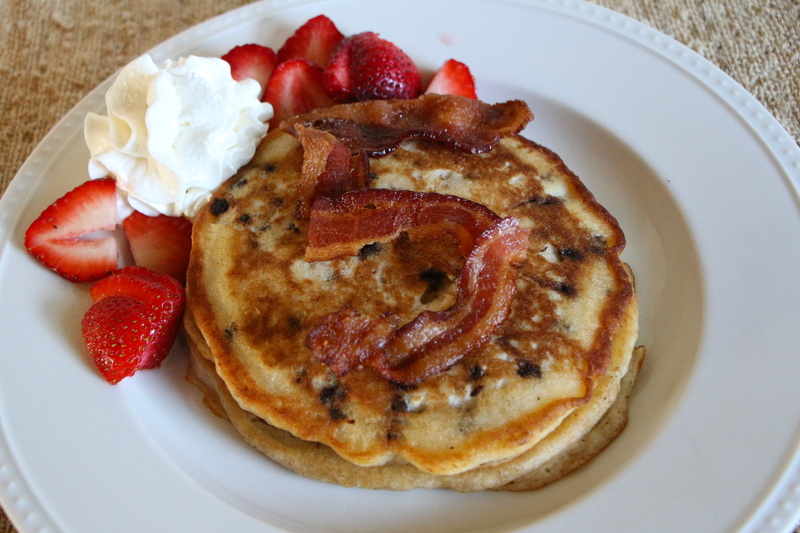 This recipe is right up your alley. 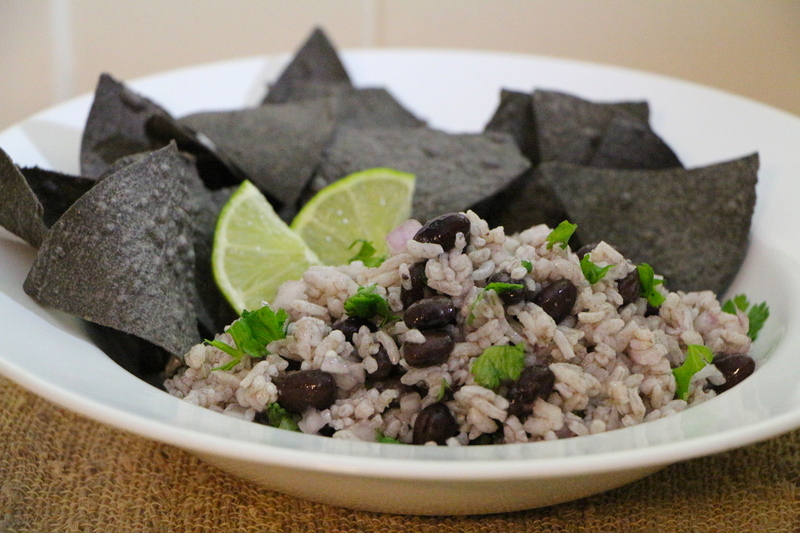 In fact, this protein-rich alternative to French fries should make just about everyone happy! I based my recipe on Bittman’s description and a bit of trial and error. 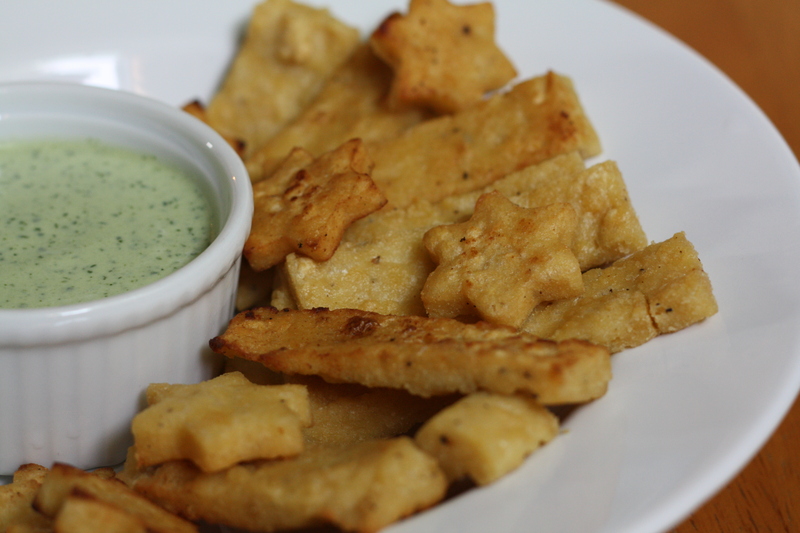 Your biggest challenge may be getting your hands on the chickpea flour necessary for this recipe. But if you’ve got a well-stocked grocery store nearby, you may be in luck. I was able to find the flour in the organic and natural foods section of my Wegmans. If you don’t see it in your grocery store, try asking at the customer service desk. Line a 13×9 inch baking dish or baking sheet with parchment paper or wax paper. 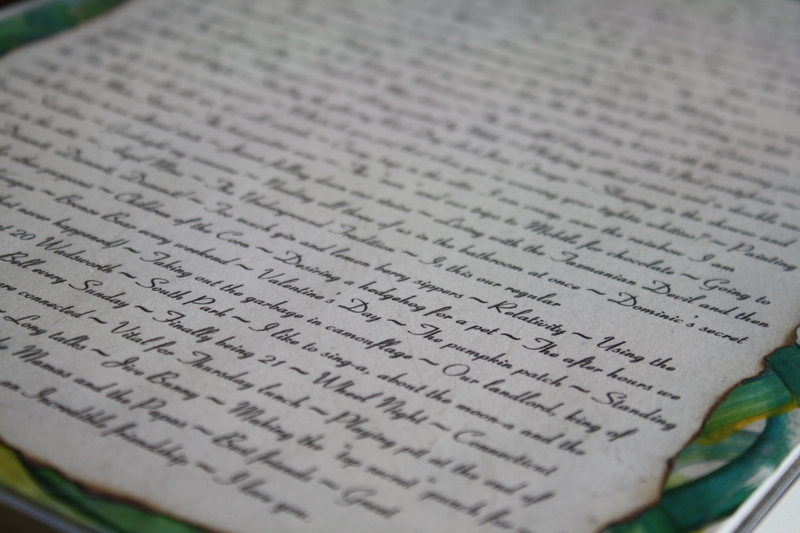 Lightly rub the paper with vegetable oil to help prevent sticking. Bring the water to a boil in a saucepan. Reduce heat to medium and gradually whisk in the chickpea flour. The mixture will thicken quickly. Add the other ingredients. Cook for about 2-3 minutes, stirring constantly. Add additional water if the mixtures seems too dry or additional flour if the mixture seems too runny. 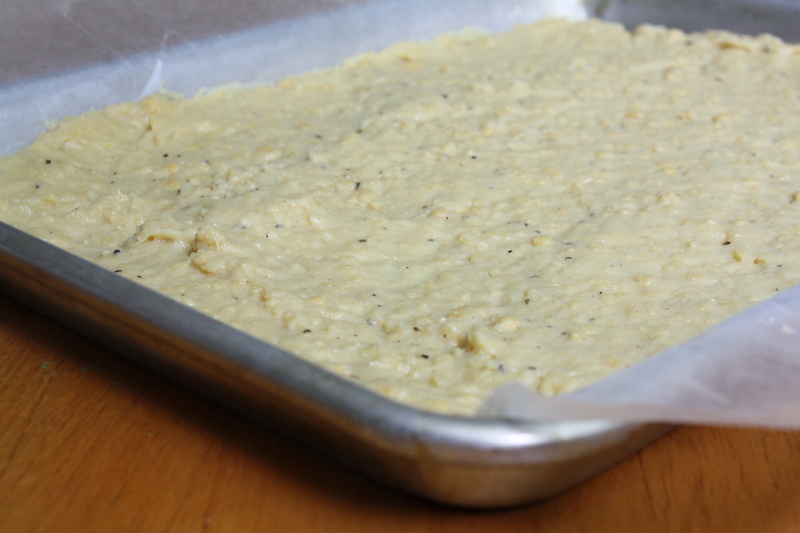 Spread the mixture into the prepared baking dish or baking sheet. Use a piece of wax paper to help press the mixture into an even layer. Cover with the wax paper or plastic wrap and refrigerate for at least an hour. Once cool, cut the mixture into the shape of fries or any other shape you desire.Heat a shallow (less than 1/4″) layer of vegetable oil in a skillet over medium-medium high heat. Place the fries into the hot oil. Cook for 1-2 minutes on each side until golden brown. Drain on a paper towel to remove excess oil. Serve hot or at room temperature. Squeeze the grated cucumber in your hands or in a piece of cheesecloth to remove as much liquid as you can. (Skipping this step will result in an overly runny sauce.) 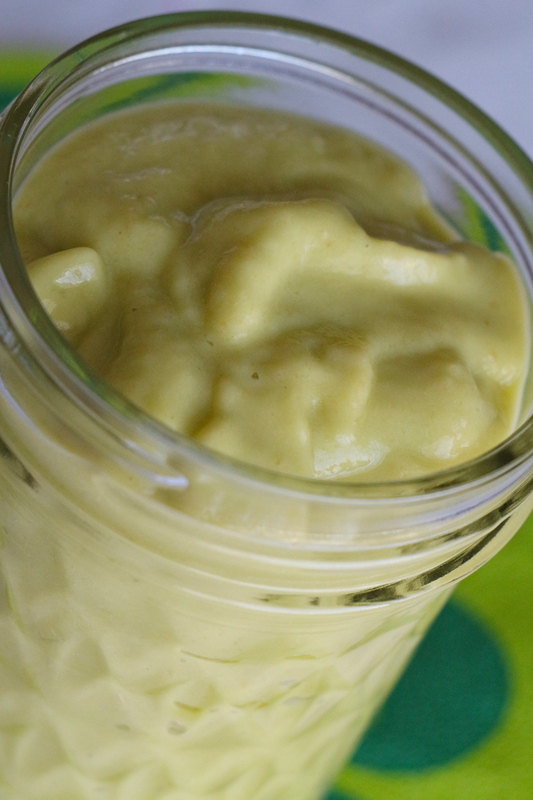 Combine the cucumber with all other ingredients in a food processor or blender. Blend until well combined. Add as much parsley as you desire, until the sauce has a nice green color. Taste and adjust seasoning, to taste. Refrigerate until serving. 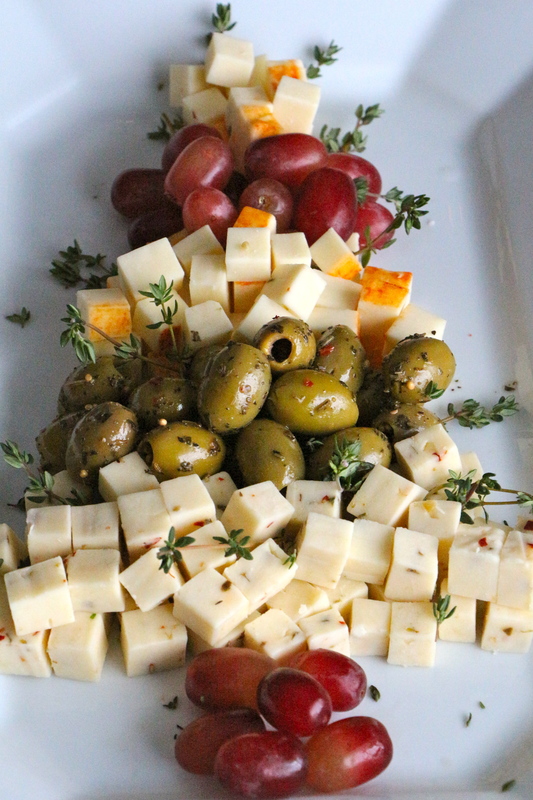 Posted in Appetizers, Dressings and Condiments, Food, Sauces, Side Dishes, Vegetable and tagged appetizers, college, Cooking, dip, dressing, friends, gluten-free, hors d'oeuvres, life, memories, recipe, Recipes, sauce, vegetarian. Bookmark the permalink. Well…the new windows are installed! What a difference it makes to have fully functional windows throughout the house! And I’m completely in love with the new sliding glass doors which open our living room to the backyard. At the moment, I’m enjoying a cool breeze being wafted through the open doors as a summer storm passes by. Ahhhh… The end result is well worth the week of craziness we endured. 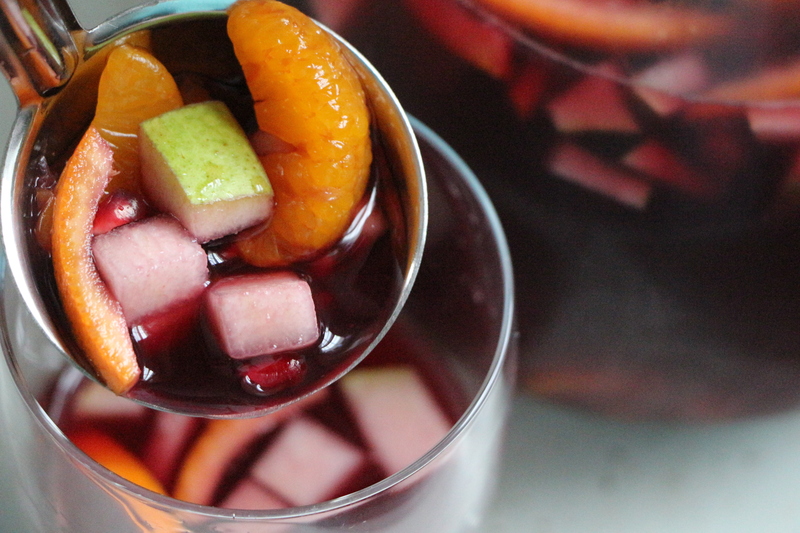 A second batch of sangria sure helped make the week a bit more pleasant too! I gave my second batch of sangria a very melony twist; loaded with three different types of fresh melon, soaked in melon liqueur, and finished with a crisp white wine. The result is a bright and refreshing summery beverage (for those of drinking age, of course); perfect in a tall glass filled with ice! 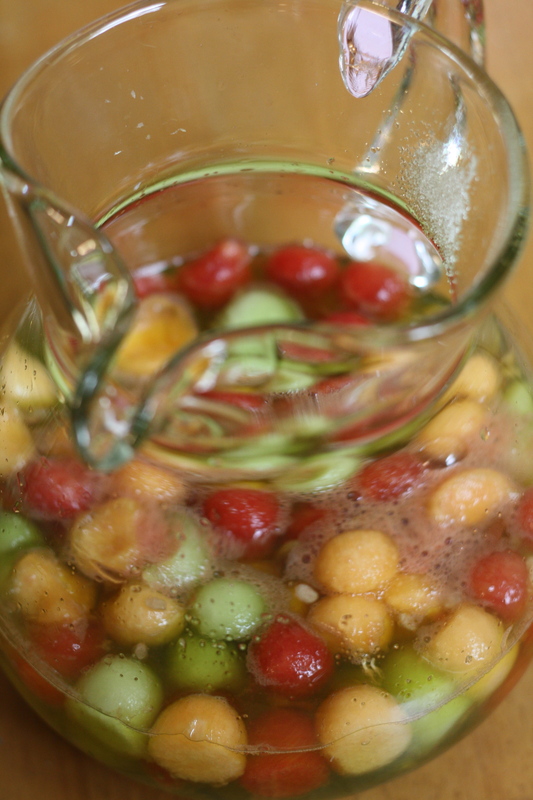 Combine melon, sparkling water, sugar, melon liqueur, and lemon juice in a large pitcher. Stir until the sugar is dissolved. Refrigerate for at least one hour. Add the white wine. Serve over ice. Posted in Beverages, Food, Fruit, Recipes and tagged alcohol, fruit, life, melon, recipe, Recipes, sangria, summer. Bookmark the permalink.